The tenth in a series of posts pinching the rosy cheeks of creative types. Copywriters, Art Directors, Creative Directors, Graphic Designers, Photographers, Illustrators; they’re an odd, mysterious bunch – or are they? Introducing freelance copywriter, Jim Archer. Hi Jim, let’s kick off with what you do to keep the wolf from the door. As a freelancer, you’re always aware of the hot breath and bared fangs of Canis lupus lupus on the other side of the woodwork. Real or imagined. Currently I work for a small coterie of agencies when they need an extra pair of hands or a pitch is in the offing. I’m pleased to say that recently I was instrumental in landing a large chunk of additional drinks business for a shopper marketing outfit and an influential health awareness incentive for a healthcare agency. But as an independent, I’m always up for other opportunities. You can reach me on 07710 439 497. So, what first got you into advertising? I started work as a messenger at Ogilvy & Mather at the tender age of 16; this was when David Ogilvy was still at the helm and long before Martin Sorrell had got his accountant’s mitts on the place. How did you transition to the creative department? I was recommended to join another agency as their print production guy. It was a small outfit and, along with my production duties, I was drafted in to draw up stuff when the CD/Art Director was away; and at that time, they used to use freelance writers, as and when. Anyway, I started to put my own headlines onto what I was drawing-up. It soon dawned on the management that they were saving on fees. Plus, my headlines were often better, as well as cheaper! This carried on and then I realised that I was doing two jobs for the price of one. So, I gave them an ultimatum, they either put me in the creative department proper, or double my salary. Not only did they make me an official writer, though junior, they hired me an Art Director to boot. David Holmes was now the CD and partner at the agency (Holmes Knight Ritchie) and they partnered me with an Art Director who came down from the Midlands to work in London. This was Stuart Newman, who proved to be a good mentor to my gauche young self. Do you feel that not having a formal creative education was a disadvantage? I regret not having the art school experience. The freedom, the hedonism and the whole experimentation thing. But, can you teach people to have ideas? I just seemed to have a knack of being able to do the job when I started out – and I believe that experience is the best education. Who in the early days showed you the ropes? Stuart (Newman) was instrumental in helping me realise the subtleties of communication. I made plenty of mistakes though, thinking I could run before I could walk. You must realise, I hadn’t been to art college or Watford, which had an excellent copywriting course back then. I was completely raw and untutored. Adrian Holmes (no relation to David) was a young freelancer who used to pop in for the odd job and he gave me lots of practical tips about writing copy. It was he that told me to read and absorb D&AD annuals – this was the best tip or rope-show ever. I might add that I received lots of help and encouragement from a good many account people who brokered my transitions and promotions. Who else have you worked with who has influenced you? The only other significant creative to have any real direct impact on me was Andy Reagan who I met at Hicklin Slade. You could throw any idea at him, no matter how left field, and he’d try and find a way to make it work. He leaves no stone unturned, and his energy is incredible. We’re great mates and still work together whenever the opportunity arises. Which creatives do you particularly admire? The people that I have admired are probably best summed up as old-school (not skool). David Abbott, Dave Trott, Tony Brignull and Tim Delaney. From a time when you had the opportunity to build a story and weave a tale about and around a product. Naturally, most of these guys had their names above the door for very good reasons. Digital and data has had such a massive impact on communications and how it is served-up today, that the pure writer’s ability to shine is much diminished. But this is now manifesting itself in blogs where the reader takes time out to consume the content. I can’t bring myself to use the term story-telling I’m afraid. Which agencies are producing the best work at the moment? Mother and Adam & Eve. Mind you, some great work is being produced direct; I’m thinking Specsavers and Channel 4 here. What skills and attributes do you need to survive in this business? Be relevant. Be useful. Be on brief. Be up to speed. Stay curious. Ah, the million-dollar question, with a million different answers. For me. 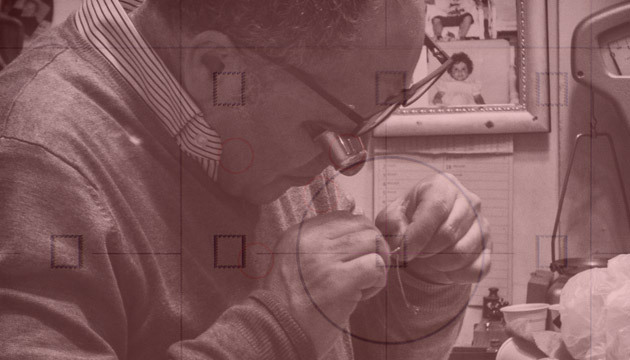 Read the brief, interrogate the product – though it’s more likely to be a service these days. Then, if you’ve the luxury of time, let it marinate in your subconscious. If you’ve no time whatsoever, it comes down to craft skills and muscle memory. Remember, you’re replaceable. So, do your best. Always. Tell me about the best and worst shoots you’ve been on. The best. A week spent in Antigua on a photoshoot for a poster for AA Travel. There was only one flight in, and one flight out, both a week apart. We kept referring to the trip as a holiday by fruedian slip which made the photographer furious. The worst. We had to cast a 14-year old teenager for Johnson & Johnson, after finding the perfect girl who had all the presence, personality and grace required, the client went against our advice and overruled us. We ended up with a girl who looked at least 27 and was wooden. The resulting film was a disaster, natch. Just the one thing? Experienced clients. What’s your favourite piece of work you’ve been responsible for? 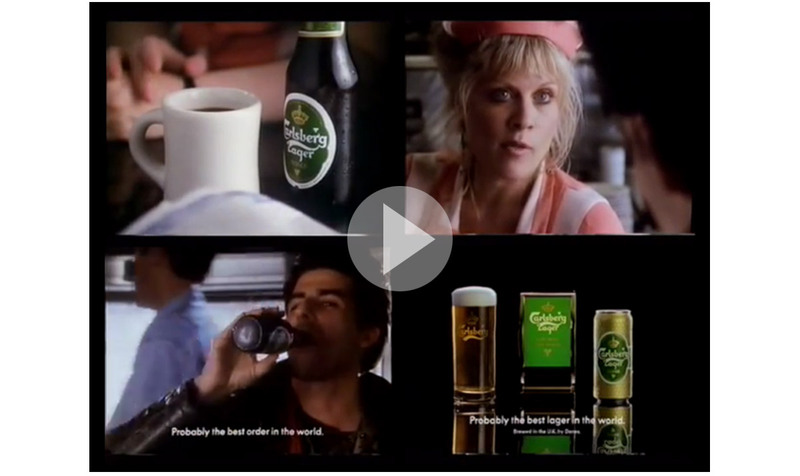 A TV spot for Carlsberg. It was bang on brief and I got to shoot it in New York. Man walks into a diner and asks for a coffee and a Danish, so naturally the waitress serves him up a coffee and a Carlsberg lager. That’s a toughie. 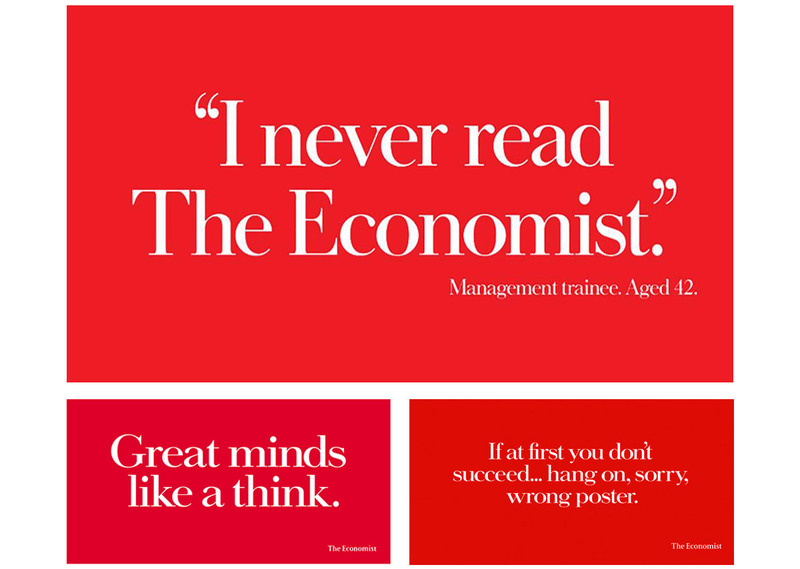 But I’ll take three of those great blood red Economist posters any day of the week. One that appreciates that you are on their side and you’re trying to do some work that will help increase or better their business. One that gives you the time and space to explore options. One that pays on time. You’ve been a CD and a copywriter. Which for you is the most satisfying? Hard to say. It all depends where you are and what you’re doing at that precise moment. I reckon you have to make the most of whatever you’re doing, wherever that may be. Being a CD has been absolutely wonderful – it’s also been a pain. As David Abbott once said: “Give me the freedom of a tight brief.” I believe that’s the best place to be. If you were stranded on a desert island, what 3 things would you have to have? The BBC, The NHS and the complete works of Shakespeare. If you weren’t a Copywriter now, what would you be? Ah, the fantasy question. So, I’ll give you my fantasy answer. If I couldn’t own and manage a vineyard somewhere, I’d love to be a wealthy art collector. Thanks Jim, sorry I can’t offer you a 3-day week, but the next drink’s on me. Cheers. Surely, half of the fun of being a creative, freelance or otherwise, is being able to dive into different worlds, learning new things and solving new creative challenges. In the last few months I’ve come up with creative concepts and written copy for: the oil and gas industry, dental hygiene, electrical engineering, health insurance, cider, a hospice, an international development charity, a 4×4, a Soho TV production company… All of it stretching me in different ways and all fun to work on. Every brief completely different to the last and absolutely no chance of falling back on formulaic thinking. …can anyone recommend any freelance online casino copywriters? It’s the same when Art Directors choose Photographers. Trying to find someone who has already shot exactly what you’re looking for isn’t always the best way forward. Look for the core talent, then get them to work just slightly outside their comfort zone. The energy and creativity that they’ll put into solving an unfamiliar challenge will blow your socks off. Of course, when you hire a professional, you need to know they’re good at what they do. When I got a builder in to build an extension, I needed to be convinced that he knew what he was doing. But I wasn’t concerned whether or not he’d built hundreds of single story extensions with the same footprint and finish as the one I wanted. I just needed to be sure he had the skills needed, wouldn’t let me down and that it wouldn’t fall over. Likewise, you really needn’t worry whether or not a great copywriter has in-depth knowledge of purple sprouting broccoli, non-destructive testing or the history of WWF. Are they really good at what they do? That’s the only ‘specialism’ you really need to concern yourself with. If the answer’s “yes”, it’s then part of their job to squeeze all the relevant information out of you/the brief/the market… and turn that into a stunning bit of work that gets results. • Check out the portfolio – is there breadth of thinking, creativity and craft skills there? • Go with your gut instinct. Of course relevant experience can be beneficial, but too much of it can end in tired clichés and lazy thinking.